"Right or wrong, he did it his way and didn't ever doubt himself." It's easy for all of us to respect someone who lived so free. I found out the evening of Saturday the 18th 2015. I had just come downstairs from putting my kids to bed. My husband asked me if I had seen my phone and I said no. He told me he got a text from my Mom. My cousin Eric died in a motorcycle accident that afternoon. Nothing registered…… Wait, what?….. He’s just, gone?….. My first coherent thought was for his girlfriend and newborn baby girl. My second was how glad I was I got to spend some time with him at Thanksgiving. And then came the overwhelming grief. And tears. Lot's of them. It feels a little unfair for me to be so upset by his death. I feel like I have no right. I should save the mourning for the people who knew and loved him day in and day out. But I loved him too. It is a loss I feel deeply. If I'm honest I didn't really know him all that super well. I knew him like a cousin. Birthdays, holidays, family reunions, that sort of thing. I don’t know what his favorite kind of food was. I honestly don’t know how he made his living. I don’t know what his deepest fears were. I couldn’t even tell you what color his eyes were. I don’t know him the way his Mother, Father, Ex-wife, girlfriend, siblings, children and buddies knew him. This is what I do know about Eric. He was a happy guy. Even when I knew he was having troubles or under stress he was happy and smiling. He radiated warmth always. I can’t even picture him without a smile on his face. He gave the best hugs. Everyone knows that. The best. Squeeze you tight pick you up off your feet hugs. And he gave them out freely and without hesitation. He was somewhat reckless and wild, an adventurer. I think he really knew who he was. He never seemed to question himself. I’m sure he did at times, we all do, but I never saw any indication of that. He loved his family. His parents, siblings and extended family. And his children. I remember seeing him and his ex-wife at a family reunion just weeks after his first son Jordan was born. I know he was nervous about being a new Dad but I also know he was so proud and excited. He was fun and playful. Eric was one of the good ones through and through. My memories of him are somewhat vague. Mixed in with all my other extended family and cousin memories. He was just always there. Happy, smiling. I remember hiking with him at Lake Powell. I remember riding jet skis on the lake and camping on the beach. Probably my most clear childhood memory of him was one year at Thanksgiving. We all stayed the night at my Aunt Does place in Camp Verde. There was probably 15 or more of us crammed in a little 2 or 3 bedroom house. So the kids, which were Eric, his older brother Jordan, my sister and me all stayed out in the pool room. I think it was actually a separate building from the main house but I don’t really remember for sure. Eric and I were 13 or 14, maybe younger, Jordan a couple years older and Mandy a couple years younger. We stayed up late and just hung out. Eric and Jordan snuck some beer. A lot of beer actually. I think they might have cleared out a cooler between the two of them. They got so stinking drunk. And they teased Mandy and me for being the good girls. We teased them right back for being drunk dumb asses. We talked and played pool. I sucked, but as the night went on my pool skills looked pretty impressive in comparison to the two of them. Not exactly a wholesome childhood memory but one of my favorites none the less. The last time I saw him was this past Thanksgiving. He gave me at least a couple of his famous hugs. He played with my son. He rubbed my big pregnant belly. We talked. He went on and on about his kids and how amazing they are. He told me about his pregnant girlfriend and how excited and also overwhelmed he was to be growing his family. We got to share about how awesome it is that we get to be parents. Years after that Thanksgiving in Camp Verde and here we were, more or less the same two people just all grown up. We are bonded together by the ties of family. The fact that I feel so close to him probably speaks to the bond our Mothers have as sisters more than anything else. Our mothers and the rest of their siblings are close. I felt it growing up and I know so did he. That sense of family we had as children is reflected in how much pride that he and I (and my other cousins) take in our own families as adults. So thank you to our Mom’s for that. On Wednesday I loaded my kids up in the car, drove 12 hours, another 2 Thursday morning to attend the funeral in Spanish Fork Utah, 2 hours back to the hotel and another 12 hours in the car on Friday home. My Aunt thanked me a few times for coming all that way to support her. And that was a huge part of the reason I packed my family in a car for three days straight. I wanted to just be there for my family. I wanted them to know I care enough to show up. As a Mom my heart aches for my Aunt and I wanted to be there for her and support her Mother to Mother. But honestly I needed to be there for my own grief as well. I needed to be with people who knew and loved him the way I did. I wanted to give Jordan and Angie and Rachel a big long hug and tell them I love them. I wanted to see my other cousins who knew him the way I did. I needed to share this experience with them. And it did help some. It was healing in a way. The trip felt good on the way up there. I was doing something. I was doing all I could. Being there for my family. But the ride back was hard for me. There is nothing else for me to do now but hurt. The mundane details of child care, nursing, diaper changes, replacing my son's headphones a million times for his movie, organizing meals and snacks, driving breaks for the kids to play offered the sweet release of practicality. But in the in between moments I just hurt. In the moments I found to myself during the day I was overcome with grief. I cried in the back of the car while trying to nap, I cried in the restroom at the gas station, I cried sitting in the front seat with my husband while my children slept. Everyone has their own way of coping with loss. Some say that the person is in a better place. They are with our other dead loved ones. We will see them again. For me none of that matters. Those things may or may not be true but it doesn’t really make a difference. None of that makes me feel one smidge better. And honestly I don’t think it should. As a Jew, I believe that this life is it. Not in a final there is nothing afterwards sort of way. I tend to think there probably is. But in a, this is the main event sort of way. This life we have in the here and now, this is it. I believe God created us in his likeness for this world. That every single person on this planet is a little bit of God’s presence on earth born with the capacity for goodness. With the ability to live and love and connect and create a better world. Every single human life holds the capacity to usher in the Messianic Age and bring this world into wholeness and peace. I believe that the loss of every single life, no matter how old or diseased or troubled that life might be is tragic and a very real loss for humanity at large. With every single loss of human life there is a little less of God’s presence in this world. I believe that that loss deserves to be honored and felt, truly and deeply. 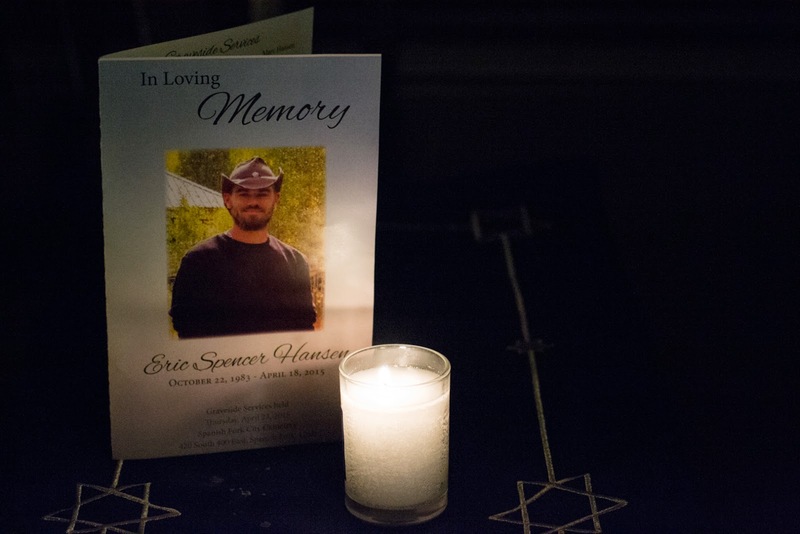 There is an Eric sized hole in my heart, in my family and in the world that can never be filled. It won’t heal and it won’t go away. With time it will feel a little less raw but it won’t ever truly heal, nor should it. And so tonight, I light a Yahrzeit candle in his memory. I mourn him and I miss him. Thank you Jennefer. I told your Mom today that I felt compassion emanating from you to me. I feel your love and support, it helps me more that you could ever know. Beautiful, well written story. Can I share it? Yes please do Liz! I love you so much! Oh Jenn you express so well the things I feel but can't put words to. Thank you for that. You are right the hole will never heal. Right now it is still very raw and hurts so much. Add to that the hurting for Liz (and everyone). Sometimes I feel like my heart is bleeding and breaking in two. I love you too! Lets hold on to that and depend on that to get us through. Lot's of hugs and kisses! I just read your post. What a beautiful expression. Thank you for sharing. We are all different for knowing Eric, and will miss him deeply. I love you so much. Thank you for sharing your heart. BTW that was pretty funny about the sneaking of beer in Camp Verde...I had no idea. I love you too! Thank you for taking the time to read it. You are right, we are all different for knowing him and for that I am grateful.